I really strive to get things right in camera. I like getting the settings right so that little to no editing is required. I like cleaning up my surroundings so that everything in the frame is exactly what I want it to be. However, there are times where this just doesn’t happen. Or where I feel like the chaos doesn’t add to the story of the image. There are definitely times when it’s OK to clone things out + there are times where it is hard or unrealistic to clone things out. 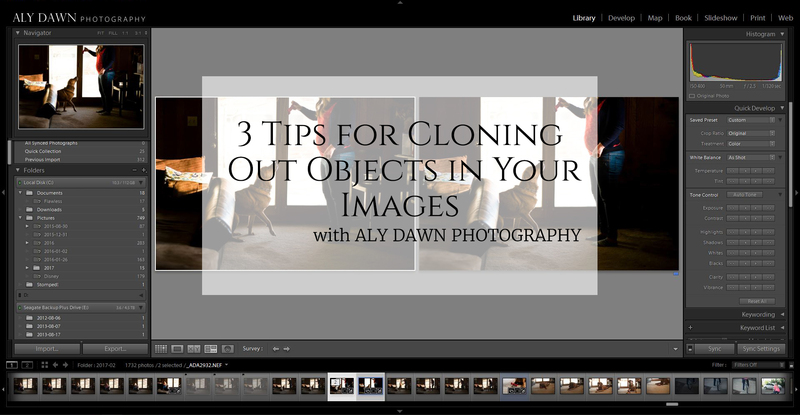 I have found that following the three tips below really help in my cloning and in cleaning up an image. When thinking about taking a picture that I know I will have to clone things out later, I always consider trying to make those objects in shadow. If I know I can’t move the things right then and there, I try to use light as my friend and put those things in shadow. Because of this, it is easier to clone out the chair, trash can, and table in the image below. Consider ways you can use shadow to your advantage to get rid of objects, and to make it easier in post processing. Taken with the Nikon D610 + Nikon 50mm 1.8. There’s a time and a place for cloning. If you have a distraction in your image and you try cloning it, but no matter how hard you try, or how long you stare at the computer screen, it just doesn’t look natural….let it go. It’s OK. Not every image has to be perfect. In fact, sometimes the things we desperately want to clone out could actually add to the story of a chaotic life. Whether that was what you were going for or not, embrace it. Not everything can be cloned out. Accept this fact and move on. I am a Lightroom user. I find that the cloning tool in Lightroom works for me 90% of the time. But there are occasional photos where I need more help than what LR can give me. When this is the case, I take my images into Photoshop where the cloning tool is easier and better. One of my personal favorite tools in Photoshop is the Spot Healing Brush Tool, it makes it so easy to get rid of unwanted objects and to polish up your image.